WASHINGTON (Reuters) - A top U.S. envoy leading a global coalition fighting Islamic State has quit over President Donald Trump's decision this week to pull U.S. troops out of Syria, a source familiar with the matter said on Saturday. 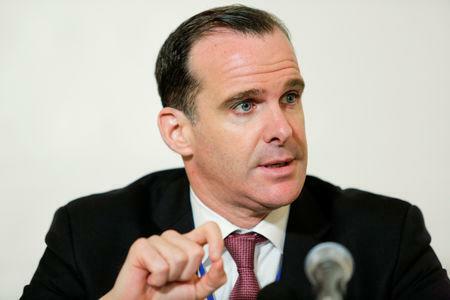 Brett McGurk, U.S. special presidential envoy for the global coalition to defeat the militant group, submitted his resignation effective Dec. 31 to Secretary of State Mike Pompeo on Friday, a State Department official said. The decision was followed on Thursday by the surprise departure of U.S. Secretary of Defense Jim Mattis, who in a resignation letter to Trump laid bare the growing divide between the two over foreign policy. 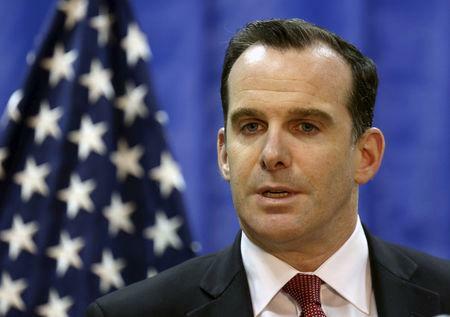 McGurk, who was slated to leave his post in February 2019, objected to Trump's decision to withdraw U.S. troops from Syria, a person familiar with the matter said, and added that Mattis' departure had a "significant impact" on McGurk's resignation. Trump, for his part, tweeted late Saturday that McGurk had simply moved up the date of his resignation and added: "Grandstander?" "The Fake News is making such a big deal about this nothing event!" he said on Twitter. A senior administration official referred to McGurk as "an architect of Obama's failed Iran deal." Trump earlier this year abandoned a 2015 landmark deal former President Barack Obama reached with Iran to curb its nuclear program. 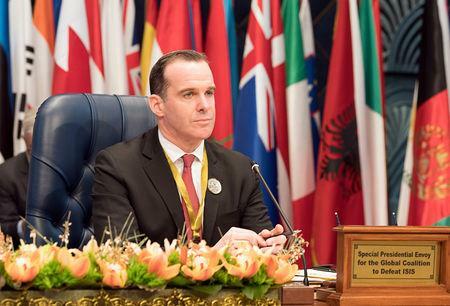 McGurk was appointed by Obama in 2015 and has been instrumental in shaping Washington's policy in northern Syria, particularly its backing of Kurdish-led Syrian Democratic Forces (SDF), an alliance of Kurdish and Arab militia that have been fighting Islamic State with U.S. support for three years. The U.S. allied forces have won significant victories against the Sunni jihadi group in northern Syria, retaking key cities such as Raqqa, once deemed the capital of its self-declared caliphate. But McGurk, along with other U.S. government agencies, believed the fight against the militant group was hardly over. "It would be reckless if we were just to say, well, the physical caliphate is defeated, so we can just leave now," McGurk told reporters in a Dec. 11 briefing at the State Department. "Nobody is declaring a mission accomplished." By contrast, Trump has claimed victory against Islamic State and considers the mission in Syria over given the group's territorial losses. "Now ISIS is largely defeated and other local countries, including Turkey, should be able to easily take care of whatever remains," Trump wrote on Twitter on Saturday. Trump's declaration of triumph has alarmed key NATO allies such as France and Germany, who said the change of course on Syria risks damaging the fight against Islamic State, which has now been squeezed to a sliver of Syrian territory.